Morveren lives with her parents and twin sister Jenna on an island off the coast of Cornwall. As Morveren and Jenna’s relationship shifts and changes, like driftwood on the tide, Morveren finds a beautiful teenage boy in a rock pool after a storm. Going to his rescue, she is shocked to see that he is not human but a Mer boy. If you've never read any middle grade, you are missing out! This story is so pure. Stormswept is so well written. It is almost lyrical, like music. I've not read a Mer story in awhile, and the summary intrigued me. I'm so glad I picked it up. I loved it! Morveren lives by the sea and finds a Mer Boy who has been beached. With her twin sister, she gets him to safety in a pool of water close by. But, not back in the sea. While Malin is trying to recover, Morveren is trying to find out how to make him better and get him back to the sea and to his people. She goes on an adventure. She finds out about the Mer people and more about herself. This is a beautifully crafted story. I can almost feel the sea calling to me now. I know it sounds weird, but it truly feels like you become part of the ocean when you're reading. I can not wait for more Ingo Chronicles! 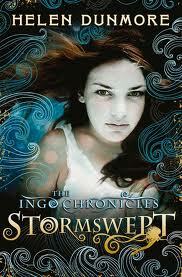 I've done some research, and Stormswept is the 2nd wave in the Ingo Chronicles series. The earlier books are; Ingo (2005), The Tide Knot (2006), The Deep (2007), The Crossing of Ingo (2008). I can not wait to read them!